Brennan Court Guesthouse is ideally located on campus with two four-bedroom apartments only five minutes' walk from the main campus. The Guesthouse offers attractive overnight accommodation for sports coaches, VIPs, visiting lecturers, new staff and short stay visitors to the university (1-5 days). The gueshouse is a comfortable apartment style residence providing self catering or bed and breakfast options to suit straitened University budgets. Brennan Court Guesthouse offers large en suite rooms suitable for work and private reading while a large kitchen/lounge provides a venue for dining and relaxation. 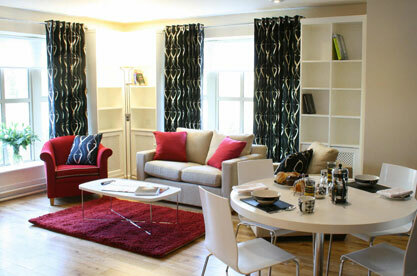 The accommodation is furnished to the highest standards throughout. A daily cleaning service is provided for short stay (bed and breakfast) guests while service is by arrangement for those staying for longer periods. 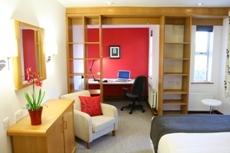 The accommodation aims to offer an alternative to hotels for short stay visitors who prefer to be close to the university. Visitors to the Guesthouse can enjoy the amenities and ambience of our attractive campus while avoiding the expenses and inconvenience of taxi transport to and from hotels.